Feel Good Stories: Asking all the Wrong Questions. I am a sucker for feel good stories. My reaction though, is two fold. First, like most people, I get teary eyed and am touched by how remarkably wonderful people can be. My second reaction is quite different. I get an uneasy feeling and wonder this story does not sound right. I do some online research, rational thinking and more often than not the facts that prompted one's heart to flutter are hopelessly skewed. 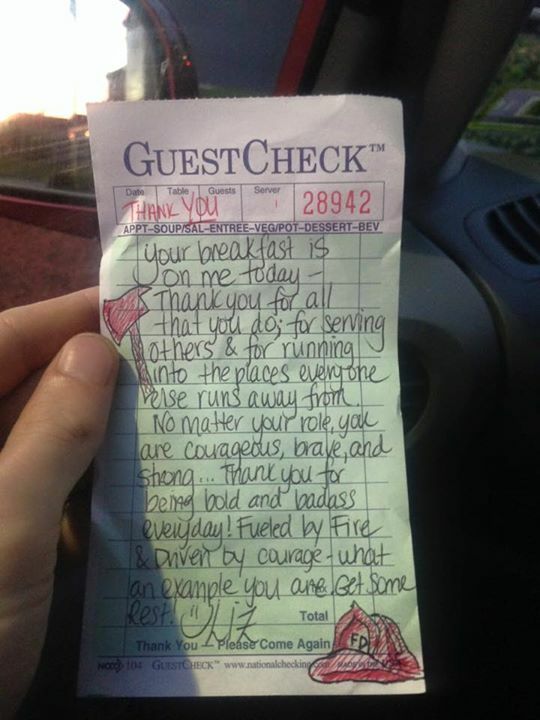 One such feel good story floating around the internet is about a New Jersey waitress, Liz Woodward, who wrote a thoughtful note to two tired firefighters who had spent the night putting out a fire that was difficult to extinguish. She wrote a wonderful note and gave them a free meal. No doubt this was thoughtful. The diner did not comp the fire fighters a meal, Liz Woodward did. The firefighters were touched. They deemed her gesture selfless and posted the above photograph on Facebook. The story is nice but not so touching to merit much more than a small story in the local Southern New Jersey newspapers. So, yes as a hawker would cry out: "But there's more!" The more is Liz Woodward father Steve who is a quadriplegic. Oh, the tragedy! The firefighters felt compelled to reward Liz Woodward and of course the tragedy in the form of her father Steve is really draws people. It is also where the story falls off the rails. From ABC News the headline is "Firefighters Meet Paralyzed Father of Waitress Who Performed Selfless Act". Dozens of similar headlines and stories abound in the mainstream press. All reports state the previous December Liz Woodward started a go fund me page on behalf of her father so he could purchase a wheelchair accessible van. She was hoping to raise $17,000. "The firefighters brought Phillies tickets for Steve, according to WPVI, which could be the first time Steve gets to leave the house other than doctors' appointments in five years". "Weddings, funerals, celebrations, and graduations... He's missed them all. Family picnics on 4th of July or out to the park to watch fireworks (we?? ?ve always watched them out his hospital window). We?? ?ve shared everything with him on cell phones in videos and photographs since he couldn?? ?t get there"
"we're just firefighters [a modest Paul Hullings]. We're also caring people, we want to be part of everybody's life". Liz Woodward: "The message is to be kind to each other, to pay it forward when you can, that even the smallest gesture can change somebody's life". Why has Woodward not left his home in five years aside from doctors appointments? Why did he miss so many family events? Why did he miss 4th of July fireworks? Why could he not go to the park? Why did Wood ward not have an accessible van for years on end? More generally why do wheelchair vans cost so much? Where was the so called social safety net that could empower Woodward to get out and about on a regular basis? Where were the humble firefighters who stated they wanted to be part of every one's life? Where was the disability community who could have supported Woodward? Why did doctors nurses, social workers, and other health care professionals that knew Woodward was a virtual shut in for years and years act on his behalf? The sort of questions I pose do not prompt a warm and fuzzy reaction. Indeed, I sound harsh in the extreme. Sorry, but I find the Woodward family's experience all too common. It is in fact the norm. The denial of basic services for people with a disability are shockingly inadequate. The Woodward family got lucky. Christina Symanski, also a resident of New Jersey, did not get lucky. She got help. She got help to die. With the support of others she died legally via VSED--voluntary suspension of eating and drinking. Essentially she dehydrated to death. Yes, this is legal and is endorsed by Compassion and Choices, the leading organization that advocates for assisted suicide legislation. The Woodward family was caught in a Catch 22 situation. All wanted the best for Steve Woodward. His problems were less physical than they were and remain social. Caring health care workers knew his situation. Perhaps they advocated on his behalf and failed. I have no doubt he is beloved by his family who also did their best for him. They likely were frustrated in the extreme and likely encountered one brick wall after another. This is one's life when disability enters the picture. Poverty and disability go hand in hand. The ADA has done nothing to change this dialectical relationship. Sadly, no one cares. Perhaps that is too hard a viewpoint. No one wants to think about disability that I know for sure. Disability is something that affects other people. Say a prayer or make the sign of the cross and hope disability never happens. This is a very bad plan. The cultural exclusion of people with a disability has been the norm in the United States. Disability is without question culturally bound. Ask the Woodward's how their life has changed since Steve was paralyzed. I am sure they were stunned at the lack of resources available. How does a middle class family afford a wheelchair accessible van when they cost up to and can be more than $80,000. Creating a go fund me page is understandable. But what is the larger social cost? Ableist beliefs are reinforced. Stereotypes are created and reinforced. Disability is an individual's problem; it is not an issue of Civil Rights. The Woodward's got unlucky. We as a society get to pick and choose who gets "help". Wrong! People with a disability do not want help we want equality. We want a typical life. This is not too much to ask. Able bodied privilege is a given until one ends up in the land of disability. This is the land of non typical bodies even our heath care system is not designed to accommodate. Entry into the land of disability is shocking to those not exposed to disability. Hell, it is a shock to me 35 plus years post disability. How can society condone the exclusion of a class of people? Why does disability seem to inevitably lead to poverty. Why are some people so fearful of disability they are hailed as strong or heroic figures when they commit suicide. Think Brittany Maynard. The failure of an individual and we as a nation is an utter lack of imagination for what could be. Imagine this. People with a disability are an important part of society. Exclusion does not exist because it is socially unacceptable--an anathema. Every small town to large city demands equal access. Ramps and elevators abound. Screen readable print matter is the norm. Deaf interpreters abound and Deaf culture is celebrated. Quiet rooms for those with sensory issues exist in every building constructed. All houses and apartment building are accessible as are all our institutions and schools. The lack of access in the broadest sense of the terms is met with outrage. Change is demanded by every person in the nation. Disability contains no stigma. Schools teach stories about how people with a disability were once excluded from the public by ugly laws. Children learn about how women terminated pregnancies because of conditions like Down Syndrome. This comes as a shock to the young who ask why? Why did that happen? Why did ablism exist? These are the type of questions we should be asking and not in some sort of far away future. I know I will never experience such a dystopia but I can dream. If my dreams come true all will benefit and the Woodwards would not need to benefit from luck.